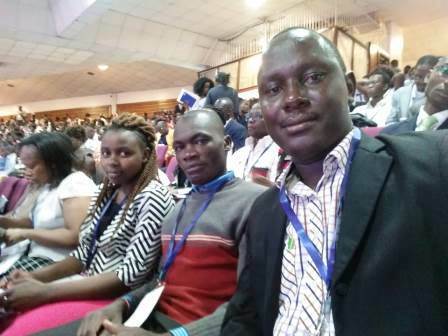 Ten CCP staff attended a two day annual Global Leadership Summit (GLS) with the theme "Everyone has Influence" held on October 4th and 5th, 2018 at Christ Is the Answer Ministries (CITAM) Valley Road. The GLS is much more than a conference; it is a catalyst for change and resources to be leveraged to transform the community. The summit is part of a year round leadership development journey designed to maximize influence and unleash transformation in a family, school, work, church or any other field. The GLS vision bearer, Bill Hybles, Senior Pastor of Willow Creek Community Church started the event 20 years ago with the aim to bring together and empower leaders through such a summit. GLS now happens in more than 135 countries and has happened in Kenya for 12 years. It runs under a philosophy that everyone wins when a leader improves. This year the summit covered the topics: Becoming a leader people love to follow, a heart to care, passion to inspire, a willingness to empower, Jesus as a leader and courage to be real by Craig Groeschel, Cultural Intelligence Drive by David Livermore, Powerful impactful influential intelligent leader by Carla Harris, Leading in infinite games by Simon Sinek, Identity, "Who am I" by Erwin McManus, Develop an abundance mindset by John Maxwell. There were also interview sessions such as Have courage and develop integrity by Strive Masiyiwa. There were also live interviews of influential leader Hon.William Ruto, Kenya"s Deputy President and his wife Rachel Ruto, David Maraga, Kenyan Chief Justice, Prof. Kivutha Kibwana, Governor Makueni County and the Biblical Principle of leadership by presiding Bishop of CITAM, Dr. David Oginde among others. Pastor Bill shared what all leaders have in common- that all leaders see MORE than others see and before others see. He encouraged leaders to believe in abundance, creativity, and flexibility. He also shared five processes to help leaders discover how they can increase their leadership capacity; Test, Fail, Learn, Improve and Re-enter. "If you are excited about what you did five years ago then you are not growing," Maxwell cautioned. On the other hand, Dr. David explained about the X-factor of Joshua, in the Bible which include: Commitment, Consistency, Courage, Contentment and Conviction. "All leaders are born but great leaders are made", he underlined. Afterwards, Prof. Kivutha talked about the Empowered Biblical Worldview, which he has used to transform the community in Makueni to be independent by working together with a common goal/vision. In his county everyone is unique and must be respected. He said a true leader is exemplary, influential and offers hope to the team. Thereafter, Hon. Maraga encouraged his judiciary docket to sort out real issues and judge them immediately with honesty. In addition, Rachel emphasized that leaders should be letters to be read, good stewards and make prayer an integral part of their lifestyle.